Take on The Big Half and help people harmed by patient safety failures. 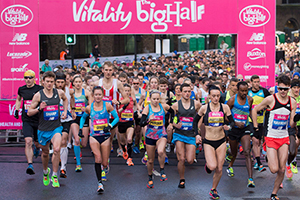 The Vitality Big Half is a new a half marathon organised by the London Marathon. Starting at Tower Bridge and finishing in Greenwich, the race passes through Southwark, Tower Hamlets, Lewisham and Greenwich. See the Big Half website for more details. Entries are currently sold out but AvMA has five guaranteed places available. Join team AvMA and secure your charity place today. Registration is just £10 and we ask for all our runners to raise a minimum of £300.